So you’re in the market for a recovery solution for yourself or your club but don’t quite know where to start looking and perhaps you don’t really know what it is that you’re looking for. You may have heard about ice baths in your research but again, you don’t really know where to start in order to find the perfect fit for you. You decide to write an ice bath wish list detailing your requirements and soon begin to get a better understanding of what it is that you’re after. Some inclusions relating to ice baths might be portability, safety, strength, functionality, practicality. You need to know that the size is sufficient enough to accommodate the right number of athletes without being too big. Upon researching ice baths for sale, you come across the Pride on the Line site and realise that the Recovery Baths may in fact be the types of ice baths you’ve been looking for. But which one – the Compact or the Duo? A quick head count and you realise that there is the starting squad to consider along with the subs so you need an ice bath with superior size which can accommodate a number of athletes at a time. Immediately you gravitate toward the Recovery Bath Duo. Let’s take a look at why this particular ice bath is the most appropriate solution in this case. The reality is that at the end of a match or training session, although recovery is an absolutely integral part of any athletes regime regardless of their level of expertise, there is a desire to streamline the processes involved in order to make them as efficient as possible. This allows athletes to move on to other areas that require attention such as nutrition or, in the case of the weekend warriors, you may need to head off to work or other commitments. The recommended time allocated to ice bath immersion is generally between ten and fifteen minutes so all you need do is a quick calculation to know how long it will take for an entire squad to recover post session. Due to the dual tubs that make up the Duo ice bath, there are provisions for a superior number of athletes to recover at any given time. Each tub has the capacity to accommodate up to three athletes at a time or up to 300kg and given that two tubs are provided, this capacity immediately doubles to six athletes. Suddenly you have an entire squad completing their recovery in as little as 40 minutes! So how is it possible to have that much recovery space in a portable ice bath? The key is in the design and constitution of the ice baths which allow them to be both sturdy and lightweight at the same time. Polyethylene is the material of choice and allows rigidity and uniformity of shape at the same time. With a tub width of 817mm, the Duo ice bath is able to fit comfortably through standard sized Australian doorways and the length provides a superior area for recovery. Perhaps the most impressive feature in terms of composition however is the depth of the ice bath. Measuring at 1130mm in height, the vessels provide considerable hydrostatic pressure, a feature integral to the maximisation of the benefits of cold water therapy. In addition to which, safety is always a top priority and the non-slip finishes on all standing and sitting surfaces provide the ideal solution to this end. But what if you want to continue your ice bath recovery off-site? This area has been taken care of too and the Duo can be neatly packed for transportation by stacking one tub into the other and then placing the steps within the top tub. If off-site locations don’t have quite the amount of space to accommodate the entire Duo setup you can always leave one tub behind and travel a little lighter with one tub only along with the step element, allowing you to maintain your recovery whilst at the same time working with the space that you’re provided with. The portability element is also a really useful feature if the team/club/gym relocates at a later date and you will obviously maintain the requirement to take your ice bath(s) with you. The fact that the ice baths are standalone and are required to be plumbed or built-in means that they can easily be transferred to a new location with complete ease. Still not convinced that the Pride on the Line Recovery Bath Duo is the ideal ice bath solution for you? What if we tell you that you can customise your ice bath to reflect your team/club/company colours? You can select from any one of 12 popular colours in addition to which you can brand the tubs with a logo(s) of your choice. You could always mix and match too to create an ice bath recovery solution which is not only practical and efficient but is a unique asset to the change room and reflects the individuality of its environment. If you’re able to take the ice bath experience up another notch, you might want to consider the option of attaching chiller/heating units directly to the Duo which enables fluent and efficient cold as well as contrast water therapy. Although the Duo tubs can be cooled and heated with the use of ice and warm water respectively, the option of using a compatible chilling and heating unit which can be plugged directly into the tubs provides a very efficient and effective means by which to do this in a fully controlled environment. With the addition of custom-built lids, the ideal temperatures can be maintained for extended periods of time in addition to which there is an added element of safety. 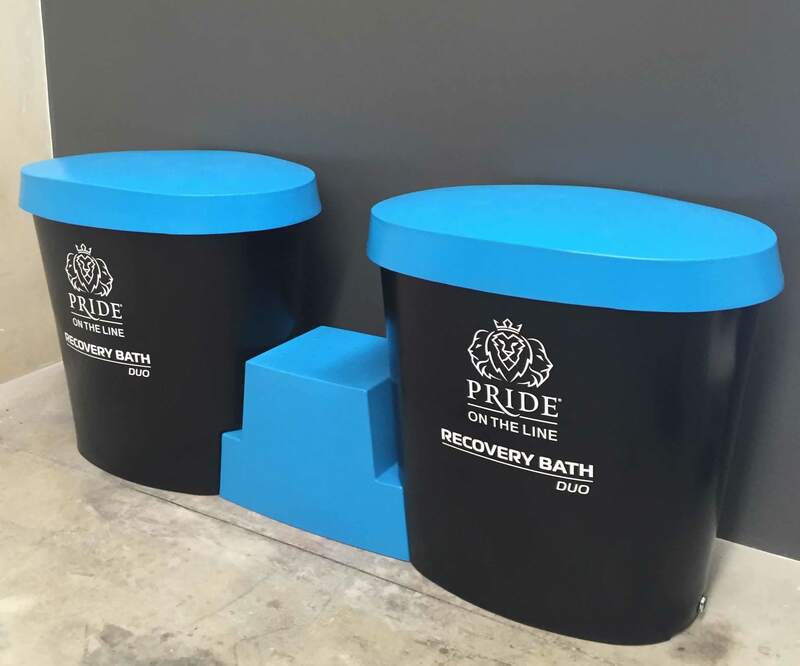 The take home message is that the Pride on the Line Recovery Bath Duo is an ideal ice bath solution for clubs and gyms alike and is a solution that can be customised accordingly to suit individual needs and requirements. Small or large budget, on-site or off, there are numerous options which can accommodate all needs and it is definitely worth your while to contact Pride on the Line today to see how the Duo ice bath can create a portable ice bath solution which is second to none. You’ll definitely be the envy of the league if you get your hands on one of these amazing recovery solutions.